Hold Or Sell Crops Now? In preparing November's cover story, American Agriculturist queried Northeast Extension grain marketing specialists about potential farmer marketing strategies. Carl German's close-up look really mandated that the advice of this University of Delaware crops marketing specialist get to you as soon as possible. So here it is. 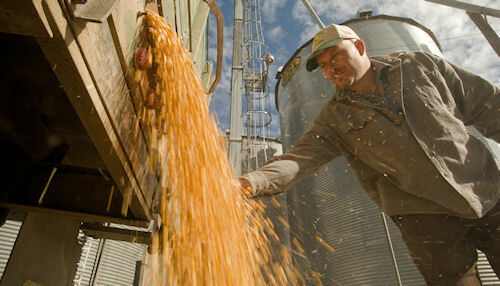 Right now may be the toughest time to address 'best' marketing strategies for 2011 corn and soybeans. Prospects for $7 corn and $14 soybeans have slipped by. Even using forward-prices sales as your starting point, the task won't get any easier. Right now may be the toughest time to address 'best' marketing strategies for 2011 corn and soybeans. August's dramatic drop in corn and soybean prices are being attributed to the European debt crisis, the September 30 quarterly stocks report showing some demand reduction, plus investor fear resulting in spec funds taking profits while heading to the sidelines awaiting buy signals. Commodity traders may or may not have overreacted to that stocks report. But investors clearly overreacted to the state of the United States and world economies. Strong bids for corn and soybeans indicate that additional sales may be warranted at this time. Price levels are still high compared to historical price charts. Nearby technical indicators are signaling that prices are trending lower in the near term. A producer with a short time horizon (a month or two) best be thinking about advancing sales. Those with a longer time horizon (two to six months) might consider holding out for higher prices that might not be offered until after the turn of the year. Consider the spreads between the nearby and distant futures contract prices. Where possible, take March as the delivery month for sales being made now. That gains 14 cents per bushel for corn and 10 cents per bushel for soybeans as of this writing. Don't make a final decision on longer term storage decisions until the first to mid-December. Currently, from Dec '11 to July '12, there is a 31 cent spread for corn. From Nov '11 to July '12, there is a 35 cent spread for soybeans. Come December, the big question will be whether the spreads have a carry or whether they're inverted? If a carry is indicated at that time, then longer term storage could be profitable. One last point: September's grain stocks report was price negative for corn, but not all that negative. U.S. corn stocks in all positions were reported to be 34% lower than a year ago. Once harvest is completed, the trade will need to determine at what price will farmers be willing to plant 90(+)-million acres of corn in 2012. Current market volatility is being driven primarily by the stronger dollar, weaker oil prices, plus a weaker and highly volatile Dow. Commodity prices still have room to move. Domestic and world demand will ultimately rule the day on deciphering your best grain marketing strategies. Farmer's Grain Marketing Primer www.GrainMarketingPrimer.com; or Farmer's Grain Marketing Decision Aid www.webixi.com/grainguide.